Back of the Cereal Box: Thag Simmons, R.I.P. 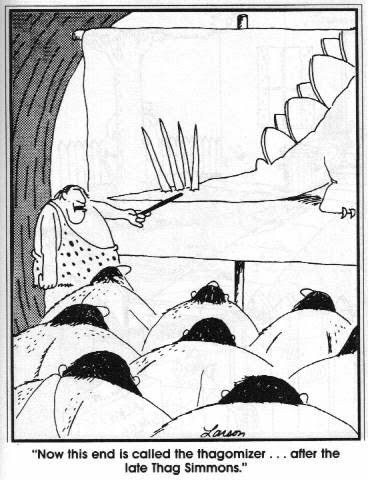 Despite its older-than-I-am pop culture references and obscure zoology jokes, The Far Side played a larger role in my young life than it should have. Hell, it ceased to be before I entered eighth grade, which alone should indicate that most of its strips would have been meaningless to me back when they were still appearing in newspapers. Still, as I’ve mentioned previously on this blog, I read it and bought the books and got something out of it all. And, via Dina, I just recently learned that The Far Side also gave a word to the world of paleontology. thagomizer (THAG-ō-mīz-er) — noun: the arrangement of tail spikes found on certain dinosaurs, most famously the stegosaurus. And though I clearly remembered the strip, I didn’t know that a real-life paleontologist — Ken Carpenter of the Denver Museum of Nature and Science — is credited as having first used the term in real-life in 1993. Thagomizer then became an unofficial but nonetheless recognized term to describe dinosaur tail spikes that has been used in other museums, including the Smithsonian. The Wikipedia entry on the thagomizer concludes with this note: “The fate of Thag Simmons notwithstanding, dinosaurs and humans did not exist in the same era.” Part of me hates that this has to be pointed out, but another part of me understands the widely varying intelligence levels of the people who use Wikipedia and therefore accepts that this sentence is necessary. And now, five lines of empty space in memory of the late Thag Simmons. If you think the Far Side is an ancient story, then you must have been born after 2000 and therefore have no recognition of the comic strip The Far Side and the implication that a comic strip could add terminology to our lexicon. What a great read! Thanks for the knowledge, shmoo especially!